There are lots of ways to make Italian sauces and pastas. A favorite or ours, and of lots of folks we know, is Spatini Italian Sauce Mix. Up until a few years ago, Spatini was available in the local grocery store. Nowadays, Spatini is only available in bulk foodservice size pouches, which we offer here at Spice Place. Cook the Italian Sausage until done, then slice into 3/8″ to 1/2″ pieces. Set aside. 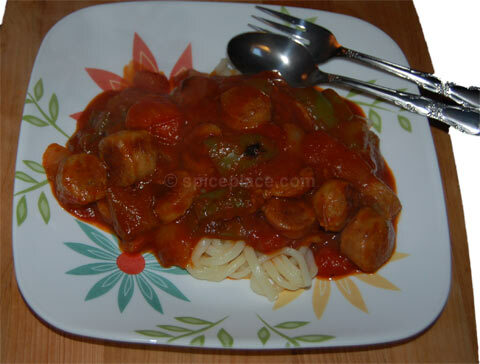 In a saucepan, cook the onions until tender, then add the Spatini, tomato sauce, and water. Return to a boil, and add the sausage. Mix well and serve over your favorite pasta.